Highway 2014 Review– Is this Highway drive Smooth or Bumpy? Whenever a movie gets released everyone looks for two things- Movie review online and words of mouth. Get ready to have a mixed and confusing review, this time yet again. Highway is a movie with a very different story that you have never heard or thought of. So it is quite obvious that this absolutely news story would be loved by many and hated by many. 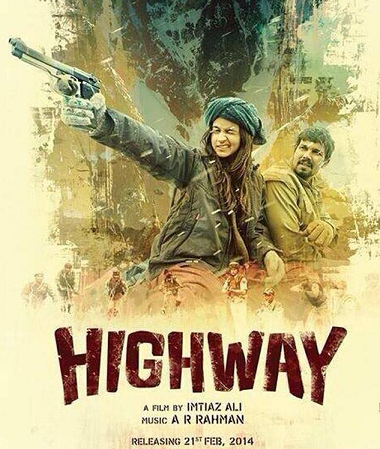 Highway is an amazing movie with great star cast and music. The movie gets shot in parts when the movie is going nowhere and suddenly comes back on track and then again loses track. I would suggest you to go to the movie and enjoy if you want to watch something that is not very predictable and has a new plot. Highway has an amazing start that will make you grab your seats and watch the movie without even blinking your eyes. As soon as you come back after the interval it seems the flawless highway, which you started your journey with has become a bumpy ride. The movie becomes a little slow, but as soon as you start to get bored, the twists and turns of the movie take it to another level. I loved the character of the innocent girl Veera who is full of life and energy. Alia has done a marvelous job in the movie. Randeep Hooda has portrayed the role of a rough and emotional guy and justified it fully. The music by A R Rahman keeps soothing your ears and gives the movie a musical success. A dramatic start of the movie gives a great kick start. A Delhi wedding and all those shoppings and craziness is going on when Veera (Alia) plans a long drive at night with her fiancée. But the drive that she planned to be a romantic one turns into a nightmare and she is kidnapped. But alike the kidnapping, which is usually sad, painful and torturous, this kidnapping is very different. Veera starts loving being kidnapped and slowly and gradually comes close to the kidnapper. Imtiaz Ali movies are more known and watch by the name of Imtiaz Ali. In a very short span, Imtiaz has got a series of his own fans. Highway is a movie that is new for Indian Audiences, they may or may not like it. But as Imtiaz is known for its out of league movies which have won many hearts, there are very less chances that the movies doesn’t taste success. Although, this Highway has bumps on the way which can slow down the speed of the success of the movie.